I love historical fiction and Margaret Skea’s books about the Munro family, Turn of the Tide and A House Divided set in 16th century Scotland are two of the best I’ve read over the last few years. 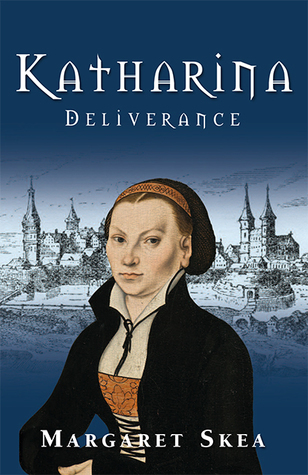 Her latest novel, Katharina: Deliverance is just as fascinating, also set in the 16th century, but this time in Germany. Katharina was the wife of Martin Luther and the book is written in the present tense from Katharina’s viewpoint and from two time periods. I like the dual aspect time line giving a glimpse of what is to come. 2017 marks the 500th anniversary of the start of the Reformation, which was set in motion when Martin Luther, a doctor of theology at the University of Wittenberg published his 95 theses, attacking papal abuses and the sale of indulgences. I remembered this from school history but it was only reading Katharina: Deliverance that the period and both Katharina and Martin really came to life for me. It’s a most moving story that transported me back in time to the 16th century and I felt as though I was inside Katharina’s mind and could feel what she was feeling. It covers the early years of her life from 1505 up to her wedding to Martin Luther in 1525 and includes, at intervals, scenes from the end of Katharina’s life in 1552. I was fascinated and so anxious for her right from the start when as a small child, she was taken from her home and unwillingly enters the convent at Brehna. Four years later, at the age of ten, she was transferred to the Marienthron convent at Nimbschen where her aunt was the abbess. It was a difficult change for Katherina – to a silent order where communication was by sign language. She was consecrated as a nun in 1515. The wind of change is blowing in the outside world and will buffet us in due time. And perhaps sooner than we think, for it is our own provincial vicar, the Reverend Dr Martin Luther, who makes the challenge, and I find myself tempted to agree with his sentiment, if not his rhetoric. Although the Church denounced Luther and his writings and ordered his books to be burnt some of the nuns, including Katharina, were inspired by his ideas and beliefs. They escaped from the convent at Easter 1523 and arrived at Wittenburg where several families helped them settle into life outside the convent. It was here that Katharina met Luther and the next phase of her life began. The year turns, the darkness of December giving way to the brilliance of a landscape cloaked in snow. The hollows on the hill behind us are smoothed out, the river below sluggish, swollen with slush. Wind blows through the valley, piling the snow in drifts, obliterating the track, neither workers nor visitors able to reach us. Within our walls, ice hangs in long fingers from roofs and windowsills, and crusts the tops of fences. Paths turn to glass and stray stems of plants snap like kindling when trodden on. In the orchard, branches bow under the weight of snow, sweeping the ground, so that we fear for their survival, and the root vegetables we would normally harvest as we needed them are set into ground so hard they are impossible to shift. Outside, the water in the troughs freezes solid, so that fresh supplies from the well must be drawn daily for the animals, and indoors, standing water forms a thick skin overnight. In her Author’s Note Margaret Skea states that her ‘book is a work of fiction, and though based on extensive research, the Katharina depicted here is my own interpretation’. I think it works very well weaving the historical facts into this dramatic and emotional story. I loved it and am looking forward to the next book, Katharina: Fortitude which will be published in 2018! I’ve spent this morning putting together a gallery tour on Luther’s influence on the way in which the art world developed over the next hundred or so years. I should definitely read this if only to get a more human view on the man. This sounds captivating. What little I know of Luther I have to dredge up from school days and I’d never heard of Katharina but your review makes me very keen to read this book. I rather like the use of the present tense for some books. The second excerpt you’ve given us is right up my street! This does sound fascinating, Margaret. In general, I agree with you about the present tense. It’s not something I generally like. But when it’s done well, it can work, and I’m glad it worked for you here. The story itself sounds absorbing, and I do like historical novels that have a real sense of authenticity. I would highly recommend this book. It is a skilful blend of documented facts and imaginative reconstruction after meticulous research of the scant evidence available of Katharina’s early life and contemporary documents of life in 16th Century Germany. I found the use of the first person narrative enhanced the intensity of Katharina’s experiences and struggles.